Next stop: Celebrity tittle-tattle, and not just any run of the mill couple off some reality TV show, this is Posh and Becks tittle-tattle, the best kind of tittle-tattle, the kind which makes you proud to be British. He was working as a footballer at Old Trafford when he met her, and now, 21 years later, the halcyon days of Man United being world beaters, the Spice Girls being a thing and Brexit only being a glint in a Eurosceptic’s eye, we’re all in a very different place. Victoria is now a fashion mogul and David can be seen hanging out with Deadpool now and again. The couple married in 1999 and now have four kids. Try explaining all that to 90s Posh and Becks. The Deadpool thing would be especially confusing. This week, David appeared in an interview on Australian TV, where he described their marriage as ‘hard work’. A source has since told The Sun it was as if a ‘nuclear bomb had gone off’ in the Beckham household after his insensitive comments. Victoria has apparently been so devastated by David’s remarks, she’s jetted off to a German stress-management clinic for some much needed R&R. 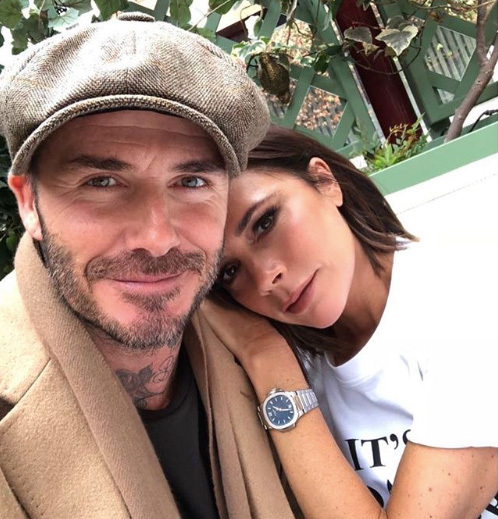 Earlier this year the couple faced unfounded claims their 19-year marriage was on the rocks, but now, claims are flying around the gossipsverse how David is increasingly looking to distance himself from Victoria while she puts up a united front in the face of ongoing gossip. When Victoria was given the heads-up on Wednesday about David’s interview, she was absolutely devastated. She has no idea why he would say such insensitive things and publicly embarrass her like this. As you can imagine, it was as if a nuclear bomb had gone off in the Beckham household when she found out. She was in pieces, and spent the next two days crying. To say it’s not been the best of weeks is an understatement. On Friday, after checking out of the resort 36 hours previously, Victoria posted a pic of herself to Instagram, walking around the German hills. Then within hours, she was reunited with David for a 22-hour flight to Sydney where they’ll meet Prince Harry and Meghan at the Invictus Games. However in the celeb rumour mill there’s never smoke without fire. Or at least some kind of heat. According to reports, David bought the couple’s £6 million Cotswolds home in his own name – the first of their properties not to be registered in both names, they’ve sold their £25 million Beverly Hills mansion, and David’s split from long-term manager Simon Fuller. David’s also said to be pushing ahead with his new football team in Miami and is ‘reportedly house-hunting in the party city and is expected to spend plenty of time in the US, away from Victoria’. He’s also stopped putting money into Victoria’s business empire.